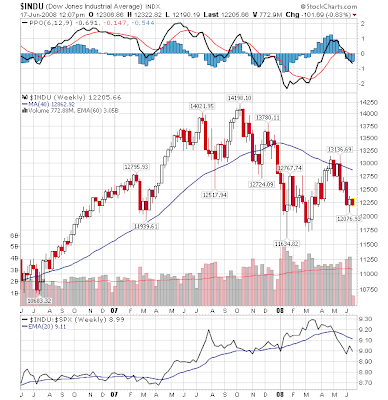 THE U.S. STOCK MARKET IS STILL IN A BEAR MARKET… Let’s be really clear: unless the Dow Industrials confirm the new high in the Dow Transports, we do not have a DOW THEORY BUY signal. The prevailing SELL signal given November 21, 2007 is therefore still in tact. Question: Does that mean we have to wait 2000 Dow points or 16% for a buy signal on the Dow? Answer: Yes. And yes 2,000 Dow points is a lot. But we are not in the business of picking bottoms. This is a business of controlling market risk. Dow Theory has always been knocked for being “late” — and it is. It is also the longest running “system” that has yet to fail to identify the major turning points or “tides” of the market. Question: Is there anything we can do to “jump the gun” so to speak? Answer: Not with respect to the US large cap stocks. There are other markets that we can invest in that are in up-trends (bull markets). 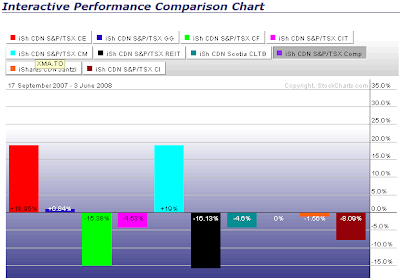 Canadian stocks, commodities and inflation-protected bonds are some areas worth consideration. 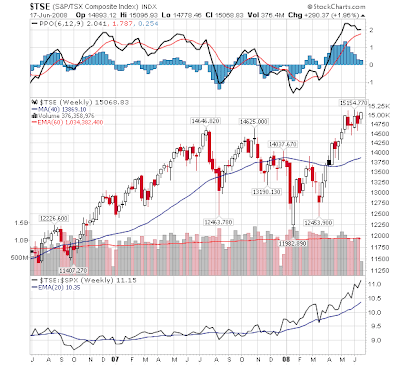 Take a look at the TSX Index (Canadian stocks). It has been a fairly narrow rally to new highs with a few stocks doing most of the heavy lifting. In fact, if you didn’t own Potash, Encana, RIMM, and Agrium, it has been a tough year. OIL PRICES ARE DUE FOR A PULLBACK… I’ve written about a potential top in Oil prices. The trading action in Oil was terrible yesterday. When prices move to a new high and then close below their previous lows, we call that an “outside reversal”. The daily chart below shows oil rallying to a new record high. But the momentum indicators such as RSI did not confirm. Nor did MACD nor did the full stochastics. This is another clue that oil could have reached a temporary top. SCG COMMENT: Tighten stop losses in oil stocks or exit weak performers. The odds of a correction remain high. GOLD IS ENTERING IT’S STRONG PERIOD… Gold traded down to $840 at the beginning of May and then rallied to $920. It then re-tested the lows near $850 and has held. This is a positive step and the seasonal odds now favour a rally. In fact, in the last ten years, Gold has rallied from July to September 8 out of 10 years. The average gain was 11.1%. SCG COMMENT: As long as the long-term trendline holds at $855, Gold can be bought here. 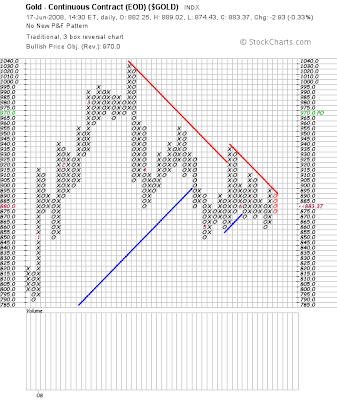 The new Point & Figure target (above) is $970. CONCLUSION: Continue to hold Canadian stocks, inflation protected bonds and commodity based currencies like the Australian dollar and Swiss Franc. Buy Gold on any weakness with a $855 stop loss. Tighten stops on oil stocks or sell lagging positions.